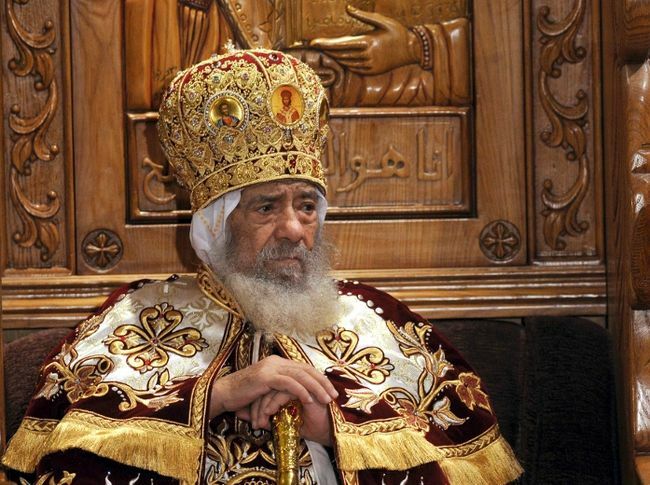 CAIRO - Egyptian Coptic Christian Pope Shenouda III, the patriarch of most of Egypt’s estimated 12 million Christians, died on Saturday from old age, his political adviser told Reuters. Bells tolled in Cairo’s Abbasiya district, site of Egypt’s main Coptic cathedral, as the news spread. Shenouda, 88, became the 117th Pope of Alexandria in November 1971, and was popular among Egypt’s Christians and Muslims alike during his four decades in power. His successor will play a central role in forging the church’s position in the country after the overthrow of president Hosni Mubarak last year. Islamist parties have since swept parliamentary elections and will dominate the debate over drawing up the country’s new constitution. “He died from complications in health and from old age,” adviser Hany Aziz said. Shenouda had recently returned from abroad where he had been seeking medical treatment. Father Anglos Ishaq, head of the church on Egypt’s north coast, said a temporary replacement would be chosen to act as the head of the church until a new pope was selected. He said the pope’s body was expected to remain in a coffin for three days, provided doctors gave their approval.